if i can keep the cost below 500 bucks thatd be amazing as this chair will cost me easy 3 grand. What would happen if you use larger front wheels with a build in "roboteers developed drive"? The little Banebots P60 would be too small for this but the P80 might be OK. To get the reduction you need would take a 4 stage gearbox for around $150 plus shipping. The brushless motor shaft would need to be keyed and the motor would need a simple adapter plate to mount onto the gearbox. I don't think a servo would have the required strength to raise & lower the drive wheel, either in it's motor or the casing. When the wheel is down, it needs to be spring loaded so it stays in contact with uneven surfaces, so the lifter motor will have to be strong enough to tension the spring. You would need a super-sized metal case servo to cope with that! There is a cheap alternative: make a short linear actuator with a drill motor and threaded rod, controlled with a hacked TZ85. That type 2 drill motor that Lindsay is selling is perfect; the built-in clutch could work to tension up the spring so when the clutch pops, that's when the wheel is fully up or down. If you happened to have a proper linear actuator, that would be even better. I know you said you don't want to convert this into a power chair, but a quick google into hub motors lead me to Golden Motor that sell a wide range of hub motors that might suit your needs. 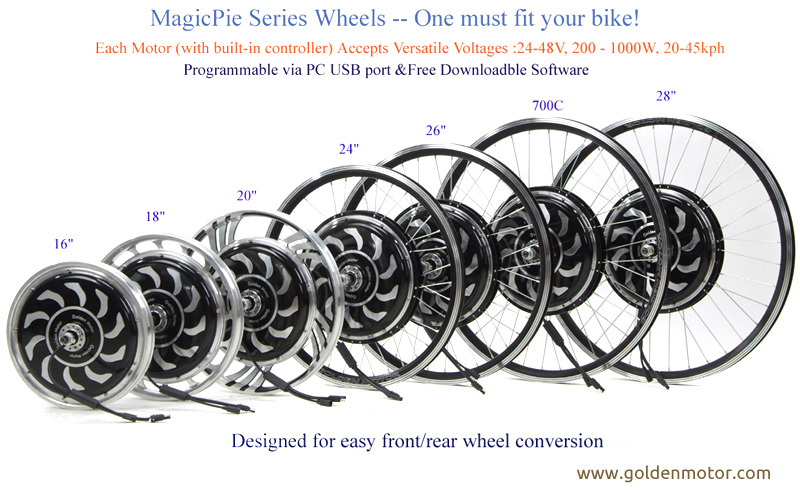 They do conversion for bikes, which from my research uses the same wheel and axle setup as a wheel chair. So it would be a 5minute job to swap it between power chair and wheel chair. They have a 24" wheel & hub motor setup that you could bolt onto the wheel chair without any modifications to the frame or such. This would avoid the whole hassle of external mechanisms and active traction setups which will probably fail in various environments. With hub motors fitted, you could still fold the wheel chair up without dis-assembly. What diameter is the tube? The above design should hang off the tube just fine - I didn't bother to draw in mounting plates for the drill to keep it simple. @ Aaron: the top right corner says 20 to 45 KMH - that's 10x more than a wheelchair! A hub motor that went slower would be pretty handy though. It looks a direct replacement of a front wheel of a wheelchair. @ Aaron: true, but only using the first 10% of the speed range could make for difficult steering. You also lose the rims for hand control, which Andrew wanted to keep. @ Maddox: Now that you mention it, yes. If this was on the front wheel, would you even need suspension? The only problem with replacing the front wheels is disengaging the motor drive when its not active - trying to turn that output shaft is near impossible! I just noticed that Golden Motor have several electric wheelchair kits: http://www.goldenmotor.com/wheelchair.htm including direct replacement hub motor wheels. Its hard to see anything being easier or cheaper than that! Shes a woman driver so thatd be ......very bad. The idea is not to make a manual chair into a power chair, i can get second hand power chairs at will from work no problems. Its mainly just when in a manual chair them brief moments where the environment throws u a curv ball and u need to get up stuff. Id like to keep the manual chair as stock as possible minus hill assist mech as pushing herself around in the manual chair may help in building up muscle and actively pushing herself from a to b may assist in her losing a smidge in weight to which would help her in that shed have less weight over her bad knees and less pain. 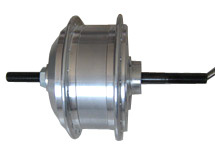 That wheelchair hub kit is crazy expensive, still alot cheaper than most solutions tho but out of price range for me. Look up e motion wheels, sorta like hub motors but only assists when u push the hand rims and such, bout 10 grand tho. Another idea also is if u search on alibaba you can get some fold up power chairs but im a little cautious as the few ive seen at work are a bit flimsy and reliability not great. Bottom line, most of these commercial wheelchairs are a rip-off! I'm still keen to work on the DIY Smartdrive option. I was reading up on wheelchairs; will this one have zero camber? It would be harder to fit a drive on to an angled tube. The solution is given on the same site as where the idea of the omniwheel back-drive comes from, the "free-wheel" in front. Just use a small linak to lower the "powerdrive" and lift the original front wheels a tad. If a "free swinging front wheel" is used, 2 brakes on the back wheels are almost mandatory, toggling a joystick requires a hand. I don't think a gaspedal is the best solution in this case. @ Andrew, I'm in far away Europe, so my contribution won't be that much, except spewing idea's. But it feels to me that a "el cheapo" add on drive for wheelchairs ain't a bad idea. Also, the website we're taking the idea's from says their kit ain't water, dust or gritproof. Especialy the omniwheels are vurnable. Let us see what we need "at least". To avoid omniwheels or other vurnable "5th backwheel approach", I like the idea of a front wheel puller setup. Less prone to wheelies too. 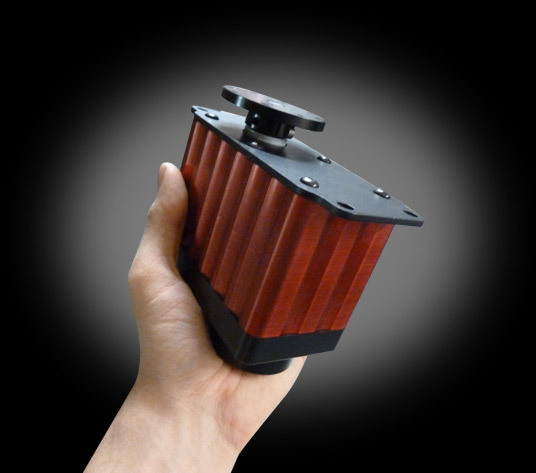 A brushless outrunner in the 2 kw range, like the Rotomax or NTM 50-60, with a low KV. Speedo that can handle the power. Gearbox. Limiting the top speed to 10 km/h or so, that's a fairly brisk walk or slow run. Wheel. Preferably a wide 8" or bigger airtyre, for comfort and terraincapability. Climbing hills and such on a colson seems a sure way to wear it down fast and uncomfy. The only expensive bit then is the gearbox. With a 280 KV motor @6S and a 8" wheel reaching 10km/h, you'll need a 24-1 gearbox. Maybe that a high batterydrill gearbox can handle it. But that will be noisy and the maybe is in the bearings of the axle. But I think we can design/make something that works. I think it can be done for under AU$500, especialy if the community kicks in.